NAGAPATNAM, India, Jan 7 2015 (IPS) - Standing amidst his lush green paddy fields in Nagapatnam, a coastal district in the southern Indian state of Tamil Nadu, a farmer named Ramajayam remembers how a single wave changed his entire life. “We were used to natural disasters; but nothing like the tsunami,” Ramajayam added. Cognizant of the impact of the disaster on poor rural communities, government offices and aid agencies focused much of their rehabilitation efforts on coastal dwellers, offering alternative livelihood schemes in a bid to lessen the economic burden of the catastrophe. The nearly 10,000 affected small and marginal farmers, who have worked these lands for generations, were reluctant to accept a change in occupation. Ignoring the reports of technical inspection teams that rehabilitating the soil could take up to 10 years, some sowed seed barely a year after the tsunami. Not a single seed sprouted, and many began to lose hope. NGO’s like the Trichy-based Kudumbam have innovated other methods, such as the use of gypsum, to rehabilitate burnt-out lands. A farmer named Pl. Manikkavasagam, for instance, has benefitted from the NGO’s efforts to revive his five-acre plot of farmland, which failed to yield any crops after the tsunami. Remembering an age-old practice, he dug trenches and filled them with the green fronds of palms that grow in abundance along the coast. Kudumbam supplied him with bio-fertlizers such as phosphobacteria, azospirillum and acetobacter, all crucial in helping breathe life into the suffocated soil. Kudumbam distributed bio-solutions and trained farmers to produce their own. As Nagapatnam is a cattle-friendly district, bio solutions using ghee, milk, cow dung, tender coconut, fish waste, jaggery and buttermilk in varied combinations could be made easily and in a cost-effective manner. Farmers continue to use these bio-solutions, all very effective in controlling pests. “The general perception is that organic farming takes years to yield good results and revenue,” TOFarM’s Revathi told IPS. “But during post-tsunami rehabilitation work, with data, we proved that in less than a year organic methods could yield better results than chemical farming. That TOFarM was invited to replicate this in Indonesia and Sri Lanka is proof that farms can be revived through sustainable practices even after disasters,” she added. 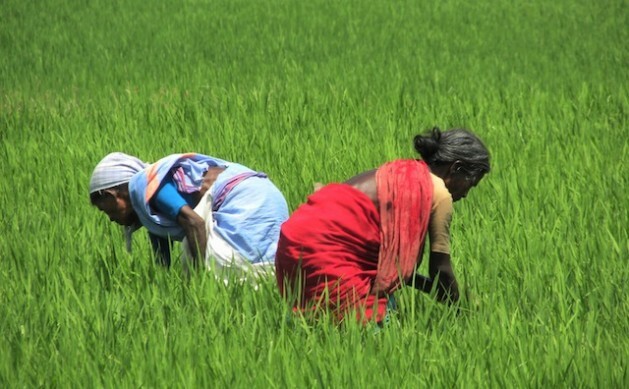 As early as 2006, farmers like Ramajayam, having planted a salt-resistant strain of rice known as kuzhivedichan, yielded a harvest within three months of the sowing season. Together with restoration of some 2,000 ponds by TOFarM, farmers in Nagapatnam are confident that sustainable agriculture will stand the test of time, and whatever climate-related challenges are coming their way. The lush fields of Tamil Nadu’s coast stand as proof of their assertion.